Of the 39 book reviews of this book on Amazon, 38 give Raquela 5 stars—one is 4 stars. This is, first of all, a true story. 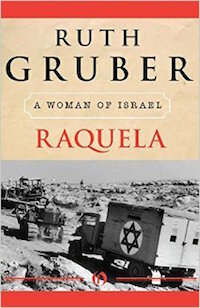 When Ruth Gruber, a foreign correspondent for the New York Herald Tribune set out in Israel to find one woman whose life “would define what it means to be a woman of Israel” (Gruber, Raquela, Forward), she found many candidates. When she heard of a ninth-generation Jerusalemite, whose family settled in Jerusalem in 1650 from Spain, who was a nurse and midwife who had delivered babies in the camps at Athlit and Cyprus for the Jewish illegal immigrants who flocked to their promised land after World War II, she knew she had found her subject. The book begins in Jerusalem in 1929 when Raquela (the Sephardic, [meaning Spanish,] version of Rachel) was five years old. Her family lived in Bet Hakerem three miles from the center of Jerusalem, described as a “neighborhood [that] was founded in 1922 as one of six garden cities developed in Jerusalem during the days of the British Mandate for Palestine” (wikipedia.com). The Arabs from the village of Colonia rose up and murdered the people of Motza, a nearby Jewish village, then looted and burned their houses. The book explains that this was the second riot since the Balfour Declaration of November 2, 1917, which stated, “His Majesty’s Government (the British) views with favour the establishment in Palestine of a national home for the Jewish people.” And, while the British police did nothing, the Arab terrorists went to Hebron, where Abraham, Isaac, and Jacob and their wives Sarah, Rebecca, and Leah were buried, and murdered all the prominent Jewish families. When the British police finally came, they rounded up the rest of the Jews of Hebron (not the Arabs) and locked them up in the police station “for their own protection.” These people were never allowed to return to their homes which were ransacked by the Arabs.